Independent explorer Heritage Oil focuses on regions which may have been overlooked and where it can participate as an early entrant. We look at its exploration efforts in two blocks in Tanzania, considered analogous with the Lake Albert Basin in Uganda. Tanzania is located at the intersection of several East African countries and its population of around 47 million consists of more than 120 ethnic groups. Bordered by Kenya and Uganda to the north, Rwanda, Burundi and the Democratic Republic of the Congo to the west and Zambia, Malawi and Mozambique to the south, the country’s eastern border is formed by the Indian Ocean. The name ‘Tanzania’ derives from the names of the two states, Tanganyika and Zanzibar, that joined in 1964 to form the United Republic of Tanzania. The Tanzanian economy is dominated by agriculture, with the industry accounting for around 80% of employment. Currently hydrocarbon production is limited to natural gas from the Songo Songo gas field, located offshore in the Indian Ocean, on Songo Songo island, about 15 km from the Tanzanian mainland and 200km south of the commercial capital Dar es Salaam. Production commenced in 2004 with the gas being transported by pipeline to Dar es Salaam, where it is converted to electricity. A new gas field is being brought on stream in Mnazi Bay, south-eastern Tanzania, with first gas expected to be delivered Q1-2015. Heritage licensed the entire Rukwa Rift Basin in November 2011, and the original PSA included all of the shallow Lake Rukwa and adjacent areas (2 blocks). Following geological studies, the northern block was relinquished to allow focus on the more prospective southern areas. Early in 2012, Heritage licensed the Kyela PSA, which is entirely onshore at the northeast end of Lake Nyasa (or Lake Malawi). Heritage Oil is an independent exploration and production company with producing assets in Nigeria and Russia and exploration assets in Tanzania, Papua New Guinea, Malta, Libya and Pakistan, looking for areas where it can participate as an early entrant. The company has two blocks in Tanzania, which are considered to have analogues with the Lake Albert Basin in Uganda. In 1997 Heritage Oil began to explore in the Albert Basin, Uganda, on the western arm of the East African Rift System (EARS). By 2008 drilling in the Kingfisher area had resulted in exploration success and individual well flow rates of over 14,000 bopd caught the eye of the watching industry. Current reserve estimates for the Albertine Basin stand at 1 Bbo, with upside for 2 Bbo – though upside estimates of up to 3.5 Bbo have been quoted. The Kingfisher well was a game changer and opened a new fairway in the African Rift Basins. Since its discovery, stimulation of exploration activity has resulted in the African rift basins becoming nearly 100% licensed. 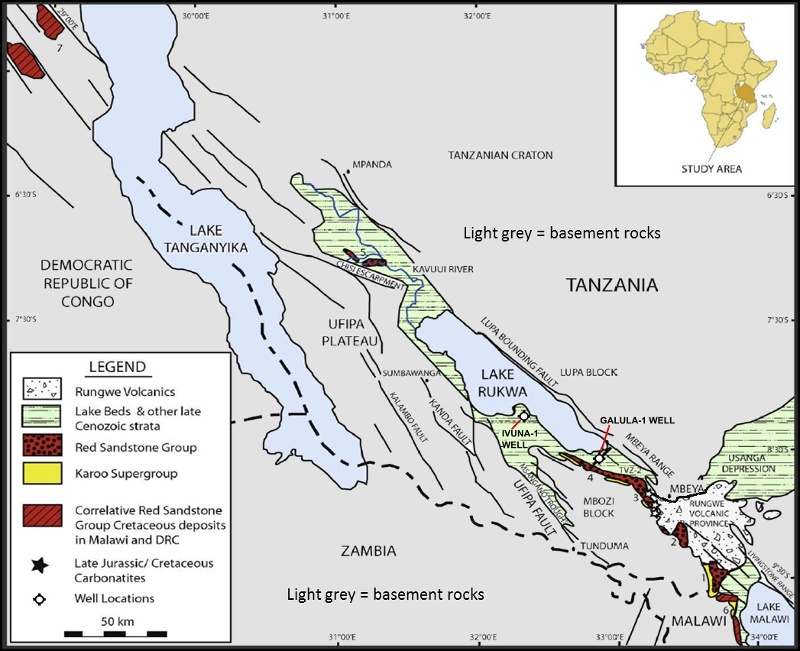 A search for basins with thick low density sequences, similar to Lake Albert, pointed Heritage towards the Rukwa Rift and the northern end of the Nyasa Rift. Following its Albertine Basin success, Heritage was keen to apply its geological and operational skills to exploring in similar African rift basins. As part of the screening process it used the global gravity database to look for basins with thick low density sequences, which may be geologically similar to Lake Albert. 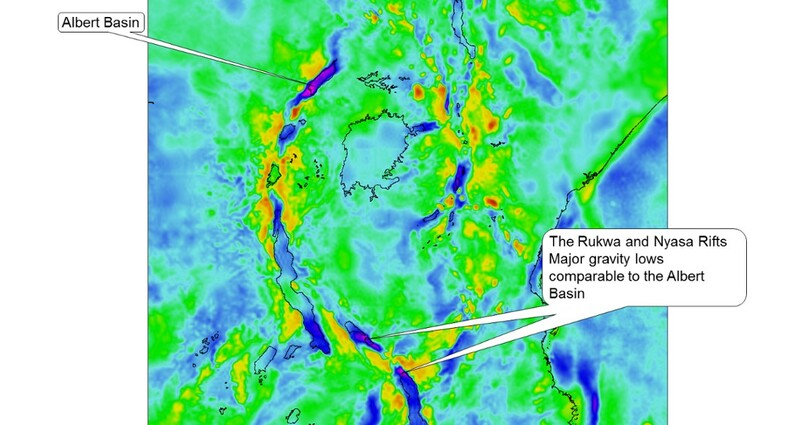 This pointed them towards the Rukwa Rift and the northern end of the Nyasa Rift, where gravity lows comparable to the Albert Basin are present. As a part of operations in Uganda, Heritage reviewed the operational logistics of drilling in an offshore riftlake location. Outline cost for drilling in a comparatively shallow (<50m) lake was in the order of $85 million – just to mobilise the rig/barge into the lake; for deeper waters the costs were considerably higher. The conclusion was to keep rigs onshore or in very shallow water and this increased the interest in Rukwa, the shallowest of all the major lakes. Geological map of the Lake Rukwa and Lake Nyasa (Lake Malawi) area, showing surface outcrops, key bounding faults and well locations. (Modified from Roberts et al. (2010), DOI 10.1016/j.afrearsci.2009.09.002) Exploration in the Rukwa Basin by Amoco in the mid-1980s resulted in the acquisition of ~2,300 km onshore and offshore legacy seismic data. Two wells were also drilled in 1987 – Galula-1 and Ivuna-1. Legacy data delineated a major depocentre with up to 4,500m of Plio/ Miocene to Recent section. Heritage considers this an underexplored basin with missed potential. Geochemical analysis of Ivuna-1 cuttings clearly indicate that oilprone Type I kerogen comprises 80–95% of total kerogen and supports the proposition that the deep water dysaerobic conditions existed for significant periods during the Neogene. Ivuna-1 is on the basin margin and it is likely that the source quality and thickness will increase into the basin depocentre. Potential stacked trap defined by roll-over against the main basin-bounding fault. The legacy well data and outcrops prove the existence of medium-coarse grained quartzitic Lake Beds sands with good potential as reservoir. Downie and co-workers consider the probability of effective reservoirs being present in the mapped leads as being highly likely. Shales with seal potential were penetrated by the legacy wells and similar shales, at similar stratigraphic levels, can be recognised in both legacy wells. With this in mind, Heritage considers the probability of effective seals as being good. If all this is true then it is important to try to understand why the initial wells failed. The team at Heritage believe that Ivuna-1 could have never worked, as it was drilled 40 km from the main kitchen area, in a migration shadow zone. Galula-1 was more favourably located but the structure was not closed to the south-east and was located in a proximal, sandy, nonsealing facies. Also, faults in this area appear to be non-sealing. 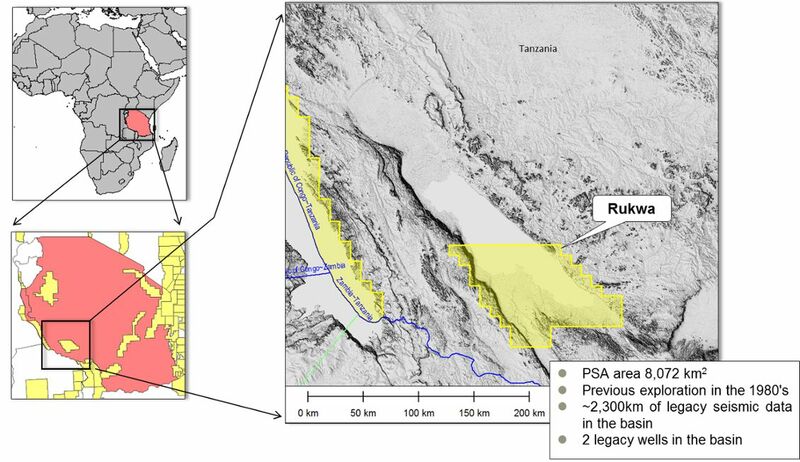 From the legacy seismic it was recognised that Rukwa had structures of probable strike-slip origin, giving rise to the possibility that structural traps similar to the Albert Basin Kingfisher field may be present. In fact, the legacy seismic suggested a number of leads of this type associated with the main basin margin fault, proximal to the depocentre, in areas that were poorly covered by the legacy seismic. In order to remedy this deficiency in seismic coverage Heritage acquired an additional 601 km of seismic. 460 km of this were acquired in the offshore areas using the same ocean bottom cable (OBC) technology as applied to Lake Albert, and 141 km were acquired using conventional land dynamite technology. The focus was to image structures right up to the basin margin fault. The results were successful and prospects defined by roll-over structures against the fault were proved at a number of locations. This onshore area north of Lake Nyasa has never previously been targeted for hydrocarbon exploration, but Heritage was drawn to it by the recognition of a major gravity low. The possibility of a major depocentre was confirmed by published seismic maps from the immediate offshore area, which show up to around 4 seconds of section. Satellite map showing results of FTG survey overlain with structural interpretation and location of seismic reconnaissance survey. Inset: same area with results of the geochemical microseep analysis and interpretation of kitchen area. As the first phase of the exploration campaign, Heritage acquired a Full Tensor Gravity (FTG) survey, by Arkex, completed in September 2012. The results were very revealing, confirming the presence of the main depocentre, extending from onshore to offshore. The data suggest the presence of flanking structural highs and intra-basinal highs. Some of these are very large with the ‘A’ Lead being around 50 km2. As a result of the FTG a 100 km reconnaissance seismic programme was sited and acquired, which proves reflectors down to over 4 seconds and validates the gravity highs shown by FTG as potential structures. The seismic thus provides clear evidence that sufficient thickness of section exists to promote potential source rocks into the oil window. In order to validate the presence of a kitchen, a geochemical microseep was commissioned from AGI across the main depocentre and onto the flanking highs. This survey showed that the basin centre was characterised by low hydrocarbon signals, whereas the flanks had high signal, exactly as might be expected if hydrocarbon generation had occurred in the basin centre with migration to the basin flanks. A second seismic infill programme is planned, to convert the gravity leads to seismically defined prospects. Exploration Insights - Full Tensor Gravity Gradiometry (FTG). Heritage, like a growing number of exploration companies, are making use of the latest technologies and tools in their efforts to unlock the hidden treasures in East Africa. With large average block sizes and limited data coverage, the vast tracts of remote acreage presents a real exploration challenge. Then, there are also the considerations of how to act in an environmentally responsible manner, whilst remaining cost and time effective. Against this backdrop, Full Tensor Gravity Gradiometry (FTG) has become recognized as a key exploration technique and many companies, like Arkex and CGG are now making that technology widely available to explorers. FTG provides an airborne means to cover large areas quickly, providing a base map against which further follow up seismic is planned. The recipe of FTG surveying, followed by selected seismic, and ultimately the drill bit, has been followed by many operators in East Africa and a large number of surveys have been acquired over acreage in Kenya, Uganda, Tanzania, Ethiopia and Madagascar. Many of the East African basins are well suited to the use of gravity gradiometry (FTG) - being characterized by the juxtaposition of Cenozoic lithologies and Pre-Cambrian basement which provides a significant density contrast for the gravity prospecting technology. FTG measures the variations of the earth’s gravity field with such a high resolution and bandwidth that detailed basement structure maps can be derived. Map showing flight lines of Arkex survey over Heritage' Kyela license in Tanzania. (Source: Arkex and Google Earth) Potential fields specialists, Arkex, worked with Heritage on the Kyela license. The license had no existing seismic and the FTG survey was designed to provide a basement structure map against which a follow up seismic campaign could be planned. 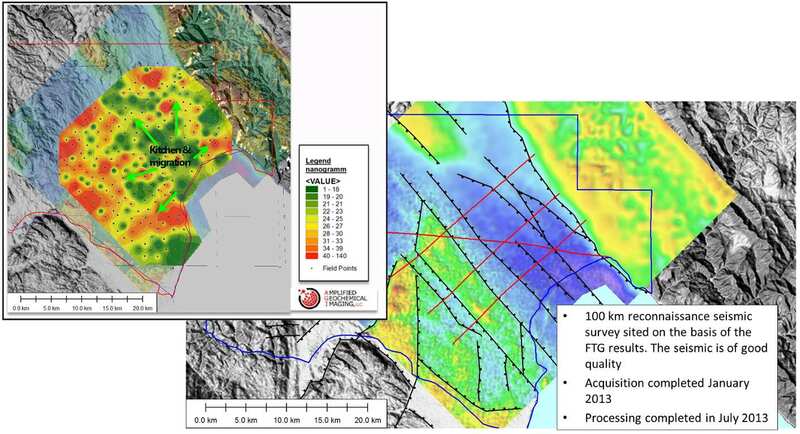 The outcome of the survey was extremely successful in defining basement configurations and the data were used to inform the positioning of the seismic campaign. There was something else that was a little different compared to most surveys. Field processed data had suggested that there may be an extension of the sedimentary basin, immediately north of the study area and outside of the original area of investigation. 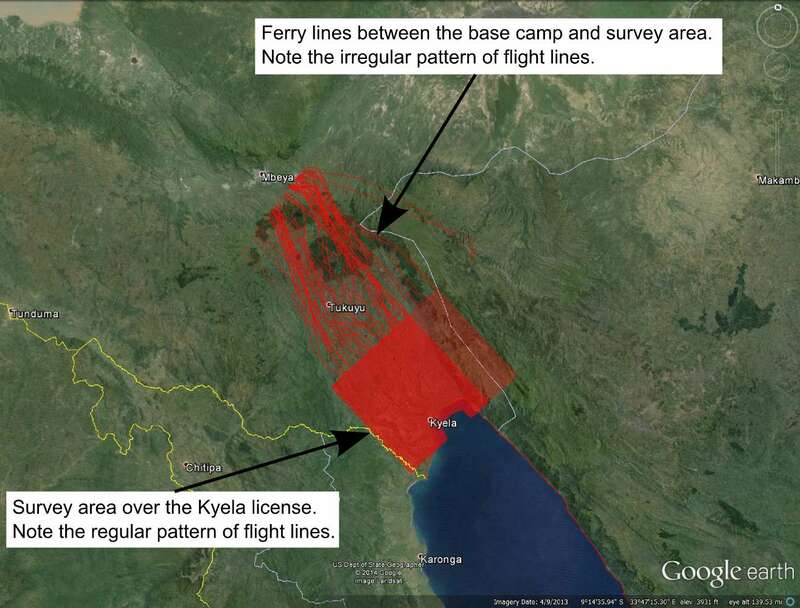 As the survey operational base was at Mbeya, 75 km from the license, this meant that the surveying aircraft had to traverse the northern area daily - and the recording equipment was always on, albeit with the aircraft taking slightly different approaches to the block on each of its sorties, resulting in ‘ferry lines’ forming a loose network between the block and Mbeya. Whilst the ferry lines were not regularly spaced and flown at varying and fluctuating height, the reasonable spatial coverage built up over the survey duration yielded promise that something useful might be extracted from these data. The challenge was to apply a processing workflow to these irregularly spaced (ferry) data in the absence of tie lines. The more traditional (Fourier based) processing routines would not have coped; Arkex used a rather unique processing routine (based on an Equivalent Source approach) which was able to cope with the varying line spacing and height of the ferry lines. Whilst by no means a coherent grid as would have been derived from a well-designed survey, they were able to turn the ferry lines into useful data. Many thanks to Paul Versnel of Arkex for his help with this part of the article. 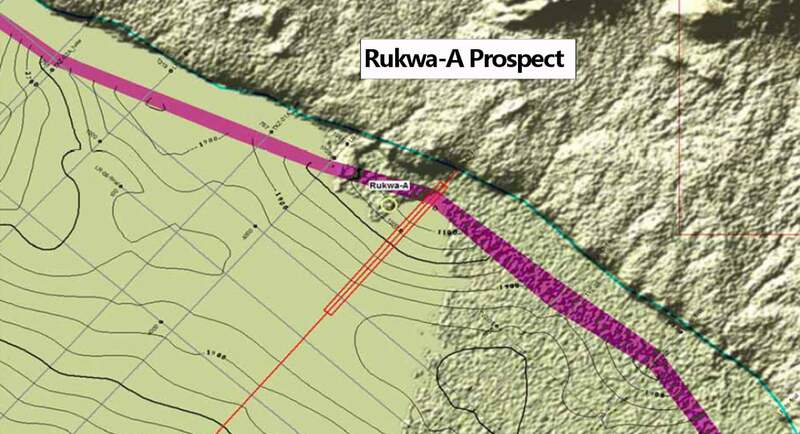 At Rukwa, Heritage has completed the mapping of the combined seismic dataset and has defined five prospects associated with inversion structures along the main boundary fault. The largest of these prospects, Rukwa-A, located at the southeastern end of the lake, has an unrisked Pmean resource of 225 MMboe (management estimate). The greater part of the structure lies offshore, but the location of a suitable land spit means that the prospect can be tested from a planned onshore vertical well. Top reservoir structure map of Rukwa-A showing closure of contours against the main bounding fault. Meanwhile, Bob Downie and colleagues believe that the initial geophysical and geochemical surveys of Kyela have proved that this frontier area has clear hydrocarbon potential, with depth of section, potential structures and geochemical anomalies all revealed. The seismic data, however, are insufficient to define a well location and Heritage is planning for an infill seismic campaign to define a well and identify a drilling site location. The pursuit of hydrocarbons in these blocks will present many scientific challenges, but the geological and geophysical studies undertaken by Heritage to date all point to the clear hydrocarbon potential of both areas. Further geophysical studies will be required in Kyela to delineate drill sites and ultimately the presence or absence of hydrocarbons will be proved by drilling. Nonetheless, Heritage is excited about the similarity of these basins to the proven African Rift Valley plays of the Albert and Lokichar Basins of Uganda and Kenya, and look to extend the proven play into these two underexplored basins.